I think I ended up on the wrong side of the park in order to find legal parking, but I still managed to find a spot where I'd be extremely unlikely to bother anyone on a Sunday afternoon. A short hike up and over the hill revealed the flagged and staked manhole cover. 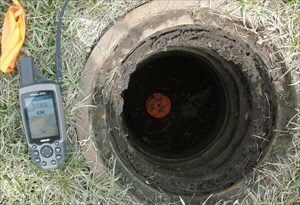 The orange painted cap was clearly visible at the bottom of the hole once the cover was removed. The paint obscures much of the date, and even blowing the photo up wasn't enough to reveal all of it. The rest of the numbers appear to be in good shape. It's an interesting spot, with the dove sculpture not far away and a good view of the glass pyramids at the Muttart Conservatory. Thanks for the cap with an unusual view.